English Title: Now the Violets are Blooming / Liebessonate (Love Sonata) / ESP!! Romanized Title: Ima Sumire Hana Saku / Ai no Sonata / ESP!! In the feudal days in Europe, Baron Ochs von Lerchenau, a prodigal and philogynous country noble, has squandered all his property, going bankrupt. He has accordingly decided to marry Sophie von Faninal, the only daughter of a wealthy and freshly peered Viennese bourgeois. He has broken free of his local love, Margarete, and has left for Vienna with a few followers, including Nikolaus, virtually in a manner of moonlight flitting. In her boudoir, Marie-Therese addressed as the young Marschallin (the Marshal's wife) is embraced by her young and handsome lover, Count Octavian Rofrano. While sleeping during their brief period of happiness the clatter of hoofs is heard outside. They are flustered, assuming the Marshal has come back. Octavian hides in the dressing room. The unexpected visitor id the Marschallin's cousin, Baron Ochs, who has come to ask her what cavalier could present Sophie with the silver engagement rose. She suggests Octavian, who at the moment is disguised as the chambermaid "Mariandel" and is trying to escape, but is lusted after by Ochs who mistajes him for Octavian's sister. Furthermore, Ochs has no scruples about saying that he is marrying Sophie for money. When at length the baron leaves them, the Marschallin and Octavian bored by his pretension feel relieved and yet Octavian finds himself stuck with the role of the cavalier. Left alone, the Marschallin falls into melancholy. She muses sadly on her waning youth, and resignedly foresees that one day her young lover will relinquish her, however earnestly she turns to him for the love badly wanting in her marriage with the Marshal. The Faninals are axcited at the engagement ceremony shortly to take place. Sophie, pretty as well as inexperienced, is feeling thrilled in expectation of the rosenkavalier and the unseen future bridegroom. Octavian dressed in white enters the Faninal's foyer. Sophie is attracted by the young and handsome cavalier at first glance. So is Octavian to her. When Ochs and his retinue arrive, Sophie and Octavian slip out of their reverie, welcoming them. However, ignoring Sophie completely, Ochs goes off to discuss her dowry and technicalities with Count Faninal, her father. Sophie, shocked at the baron's crudeness, seeks Octavian's protection, vowing that she will never marry Ochs. Octavian stands up against the tipsy Ochs teasing Sophie. Consequently, both of them draw their swords. Before long, Ochs is grazed by Octavian's sword and lets out a melodramatic yelp. In the ensuing confusion, Sophie insists that she will never marry the baron. Outraged, Count Faninal turns Octavian out. As Octavian comes out of the Faninal's foyer, a young woman suddenly sinks collapses before him. After nursing her, he takes her to the Marshal's house. She turns out to be Margarete. She has come to Vienna with her foster parents, Richard and Annina, in search of Baron Ochs. According to her, Ochs vanished just ahead of his entering into betrothal to her. In his letter addressed to her, the baron pledges to marry her provided she accepts his ring and spends a night with him. Listening to her story, Octavian hatches an intrigue. He reveals it outright to Sophie while visiting her father who is mostly confined to his bed in the wake of the mess. Baron Ochs continues to make marry, chasing women in bars, and disgusts Nikolaus and other followers who had reluctantly left their homes in order to come along with the baron. Under such circumstances, Richard and Annina approach the baron's followers with the intrigue. The followers wish to go home as soon as possible, and so agree and once, and the intrigue begins. Nikolaus hands the baron a letter, pretending that it is from the girl named Mariandel, and successfully leads him to the Bar Eagle. Ochs is delighted to find Mariandel in the bar and immediately starts wooing "her." The fact that Octavian is disguised as Mariandel is the last thought in the baron's head. Now appearing to be tipsy with drink, Mariandel begs the baron for his ring. At first he declines "her" pleas and at last he gives "her" the ring. Smiling in a suggestive manner, Mariandel urges Ochs to wait for "her" in a nearby pavilion. As Octavian comes out of the pavilion, the vice squad, Cound Faninal and Sophie arrive, called by Nikolaus according to the secret plan. The vice squad lets Ochs know of a complaint that he is engaged to Sophie despite the fact that Margarete spent a night with him accepting his condition to marry her. Ochs denies the accusation, but then Margaret dashes out of the pavilion, declaring she has just tied the nuptial knot with him and is wearing the ring inscribed with the baron's family crest. Before Ochs in blank amazement, the Marschallin and Octavian come out to reveal the secret of Mariandel. Ochs realizes he was outwitted. Ochs breaks off the engegement to Sophie and promises anew to marry Margarete, who we learn is in fact secretly in possession of a large fortune. As for Sophie and OCtavian, Octavian dares not tell the truth, being anxious about the Marschallin. The Marschallin turns to him. Containing her emotions, she wishes him a happy future with with Sophie and leaves, alone. Octavian says adieu to his former free life and now without hesitation tells Sophie that he loves her. This was a special traditional performance for both the opening of the new Tokyo Takarazuka Theater and the beginning of the new century. As the curtain rises with a chorale, a group of singers dressed up in formal kimono sings the celebration song in front of the modern Japanese screen of gold and silver hues. The Chinese characters for "kotobuki" befitting to the auspicious celebration comes down. The celestial king and princes appear from below the stage adorned in red and white Japanese gala attire. They sing and dance the praises of world peace. The drops symbolic of Hana (flower), Tsuki (moon), Yuki (snow), and Sora (cosmos) tears come down. Hanajido (floral child) comes up from below the stage, taking the place of the celestial king and prince. Hanajido sows the seeds of the violet and dances wishing the seeds to bloom. The beautiful violets come into their glory. On the scene decorated with boquets of violets, young men and women dance, wishing Takarazuka continuous prosperity and celebrating the beginning of a new century. The celestial king and Hanajido, respectively disguised as a young man-violet and a young woman-violet, join the group of young men-violets and young-women violets, culminating the dancing. 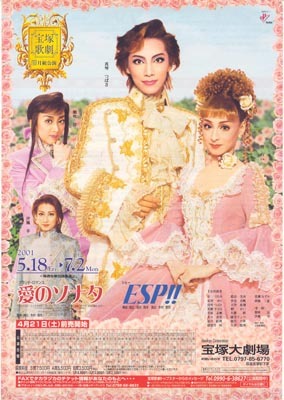 This was the first performance in the new Tokyo Takarazuka Theater, and both shows played here first. Ai no Sonata ran later in the Takarazuka Theater, while Ima Sumire Hanasaku was not performed there. Koizumi Kirara retired on 11/13, while Kou Suzuka and Akizuki Shou retired at the end of the run on 2/12. Created by caithion. Last Modification: Sunday 08 of June, 2014 17:45:34 PDT by KaleidoscopeKingdoms.